Chalet Bella is a lovely chalet with 3 floors, situated in a peaceful rural area of Pays du Mont-Blanc with beautiful views of Mont Blanc. It sleeps up to 10 people and is only a 55 minute drive from Geneva International Airport. With Plaine Joux only 10 minutes drive up the mountain and Chamonix, Megeve, Combloux all within a 20 minute drive, why stick to one resort? Les Gets is 45 minutes and Morzine is one hour away. Please click on the Location page for a map and directions. 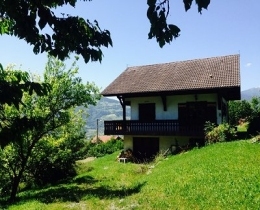 Chalet Bella is an enjoyable place to stay both in the winter and summer months; it is within easy reach of numerous ski resorts and situated on the south facing side of the Chamonix valley, with amazing bike and walk routes. Nearby activities include paragliding, rafting, paintballing, pony trekking (next door), mountain biking, climbing and ice climbing.